The new Fixturlaser Dial Indicator Kit is designed to work with the Fixturlaser Dials app. The Dials app walks the user through the alignment and performs all the required math calculations, making the alignment quicker and easier. As a company that’s out to Realign America, we want to offer the very best tools to get the job done. Fixturlaser has developed a new dial indicator kit specifically designed to perform reverse dial alignments using the Verti-Zontal Compound Moves™ method. The Verti-Zontal method was developed by VibrAlign to make shaft alignments quicker and easier. It achieves this by reducing both the amount of bolt loosening and tightening as well as the number of moves required to achieve alignment. The new Fixturlaser Dial Indicator Kit is supported by the Fixturlaser Dials App. The Dials app walks the user through the Verti-Zontal alignment with a detailed 3D graphical interface. Even better, the Dials app performs all the complicated alignment math. The app, available free from both the Apple App Store and Google Play, is ideal for use on a tablet. The Fixturlaser Dial Indicator Kit is available from VibrAlign’s new Alignment Store and Resource Center at http://www.ShaftAlignment.net, as well as from Lovejoy and other distributors. More information about the Fixturlaser Dials App, along with the free training videos, can also be found at the Alignment Store. VibrAlign was started in 1983 as a vibration and alignment service organization and later became a distributor of equipment which, appropriately, equipped the company to better serve its customers. 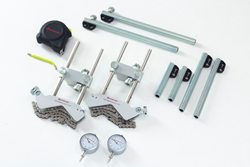 VibrAlign is America’s exclusive distributor of Fixturlaser® – the manufacturer of the new Fixturlaser EVO laser alignment tool. For more than thirty years, VibrAlign has been growing across the country. Today the company, operating out of local offices in every major region of the U.S., is out to realign America.